On 11 December 2014, 0800 hours, law enforcement agents from the ABC Board, Town of Bedford PD, and the Virginia State Police assisted the Bedford County Sheriff’s Office, Vice/Drug Unit, in the service of arrest warrants on eighteen persons charged with the distribution of illegal drugs and prescription drugs (pills, cocaine, marijuana, and heroin). The arrest took place throughout the county and in the Town of Bedford. A list of persons arrested and the exact charges against them will be provided to the media as soon as possible. Taking these drug dealers out of our communities may have saved a life during this Christmas Holiday…citizens of Bedford County, keep up the good work! 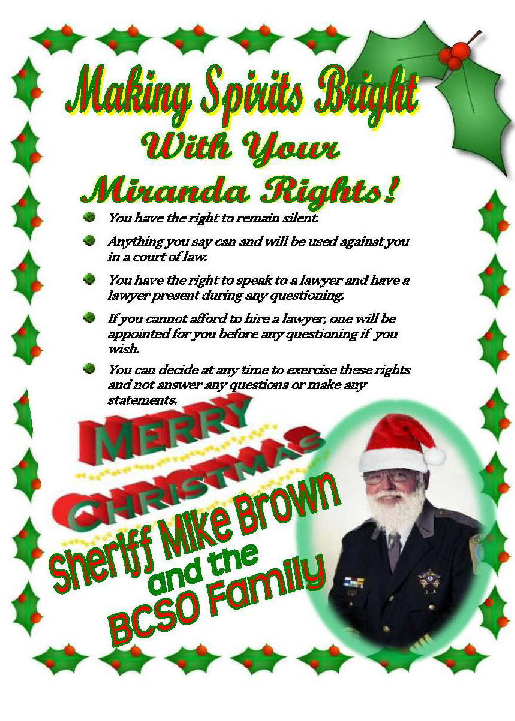 As in past Christmas ‘Round Ups’, we presented every person arrested our, now famous, Miranda Christmas Card that is attached to this email. Most took it in the spirit of holiday giving and several weren’t too happy to get them. On October 5, 2011, investigators with the Bedford County Sheriff’s Office, Vice Unit, obtained a State Search Warrant for the residence of Aston Earl McCrea, located at 3764 Spradlin Road, Goodview, Virginia. The search warrant was obtained as a result information provided by Roanoke City Police Department, Vice Unit, and Homeland Security Investigations (HSI). Bedford County Investigators were informed that a UPS package was interdicted in Roanoke City containing approximately 50 pounds of marijuana and that a controlled delivery of the package would be delivered to a subject that resided at 3764 Spradlin Road, which is located in the Goodview area of Bedford County. Investigators then conducted a controlled delivery of the package to Mr. McCrea at his residence located in Bedford County. Bedford County Sheriff’s Office led a search warrant at McCrea’s home assisted by Department of Homeland Security Special Agents, the Roanoke City Police Department, and the Virginia State Police. A search of the residence located the marijuana shipment along with a firearm and currency. The joint investigation revealed that McCrea was party to an interstate conspiracy to traffic large amounts of marijuana into Virginia where he arranged for distribution of the drugs in the Roanoke Valley and surrounding area. McCrea admitted to investigators to receiving large shipments of marijuana for several months and profiting approximately $77,000.00 from illegal marijuana sales. McCrea was charged with conspiracy to distribute more than 100 kilograms of marijuana, conspiracy to commit money laundering, possession of a firearm by a convicted felon, and possession of a firearm in the furtherance of a drug trafficking crime. The United States Court of Appeals for the Fourth Circuit recently affirmed the forfeiture of McCrea’s property, which includes a single-family residence with approximately 49.54 acres of land. Homeland Security Investigations plans to secure the property this week. This release was held until this date as the result of appeals on the sentence handed down and the seizure of the assets of the subject. Operation Pain Train was initiated by Bedford County Sheriff’s Office, Drug Investigators in October of 2009. It originally started as a Counterfeit Money/Prescription Pill Distribution Case involving many of the same players that were indicted in Pain Train. Soon after initiating the case, an overdose death of methadone occurred. The methadone had been obtained from an illegal sale of the prescription medication. There was at least one other overdose death attributed to this operation. There were several search warrants completed by Investigators of the BCSO and arrests were made in reference to the Counterfeit Money Operation. The focus was then turned to Narcotics Distribution and the Illegal Sale of Prescription Medication. Bedford County Sheriff’s Office was ably assisted by the Virginia State Police, the Bureau of Alcohol Tobacco Firearms and Explosives, and vigorously prosecuted by the US Attorney’s Office, Western District of Virginia. This investigation would not have been as successful as it turned out to be had it not been for the close knit association of all of these ‘team players’ and their overriding desire to ‘Sweep the field clean’ of the criminal elements that would ply their illegal trade to the citizens of Bedford County and other locations. Their efforts resulted in the indictments of 37 people on charges pertaining to the distribution and illegal sale of illicit narcotics and prescription medication. The 37 defendants are listed on the attachment along with time to be served, which totals to 170 years of prison time! Judge Norman Moon, Western District, US Federal Court, Lynchburg, Virginia, presided over each of the 37 court hearings and his sentencing should have left no question in the minds of those who would choose the illegal drug trade as a business venture…don’t do it in the Western District of Virginia! Property crimes have dropped since this case has been finalized. At 4:06 p.m. today Bedford County 911 dispatchers received a call from a female who was yelling and screaming for the police and then dispatchers lost contact with her. The call came from a cell phone and dispatchers plotted the call to 1625 Teass Terrace. At 4:13 p.m. Bedford County deputies arrived on the scene. After arriving deputies found a female victim who had been assaulted with an ax. Shortly thereafter, deputies reported that the male who had assaulted the female had been shot and requested rescue units. The female victim was transported to Bedford Memorial Hospital by ambulance. Deputies performed CPR on the male suspect until rescue units arrived and he was pronounced dead. The Virginia State Police were requested to respond to the scene and will be investigating the incident. Since the Virginia State Police are conducting the investigation the Bedford County Sheriff’s Office will not be making any further releases. 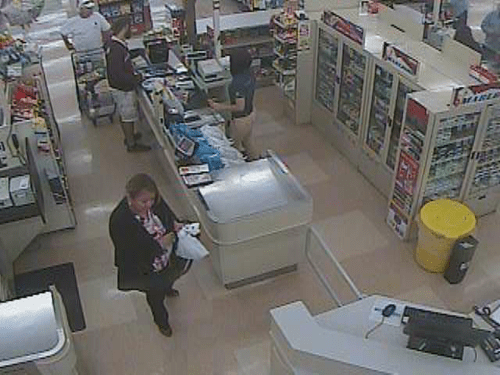 The Bedford County Sheriff’s Office is investigating credit card fraud that occurred on October 10, 2014 at the Food Lion in Forest. 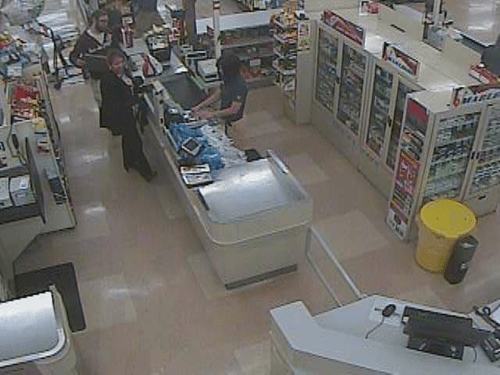 Investigators are seeking the assistance from the public in identifying the female who is the suspect in the fraud. 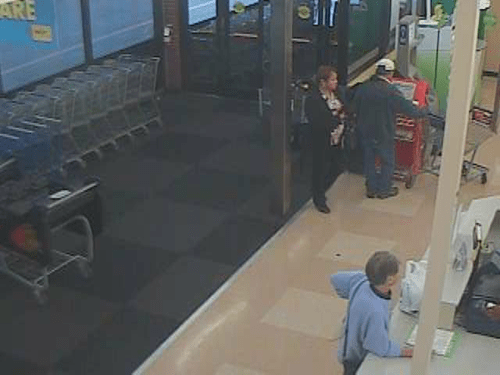 Anyone with information on this crime or knows the identity of the suspect is asked to call the Bedford County Sheriff’s Office at 540-586-7827, submit a web tip here, or contact Central Virginia Crime Stoppers at 1-888-798-5900. 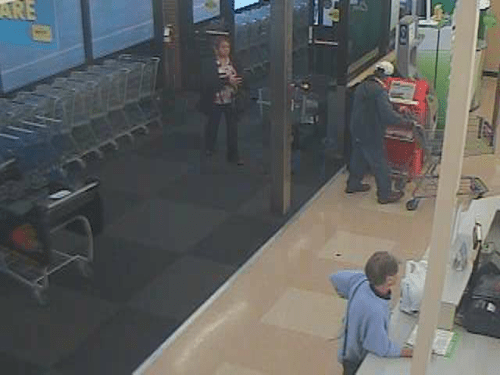 Crime Stoppers callers remain anonymous and could receive a cash reward up to $1,000.00 for information that solves crimes. Bedford County Sheriff’s Office School Resource Officers and sheriff’s investigators are investigating a threatening message found on a restroom wall at Staunton River High School this morning. The SROs, from Staunton River High School and Staunton River Middle School, are working with school officials to ensure the safety of the students and staff at the school. Bedford County Sheriff’s deputies along with the Virginia State Police are on the scene. Explosive K-9s from the Bedford County Sheriff’s Office and Roanoke City Police Department are assisting with the investigation. The investigation into the threat will continue. On Wednesday morning, Bedford County Sheriff’s School Resource Officers arrested a Jefferson Forest High School student and charged him with writing a threat against the school and students, which is a felony. The threat was found Monday afternoon written on a restroom wall in the school. The student was taken into custody and transported to the Lynchburg Juvenile Detention Home. Bedford County Sheriff’s Office School Resource Officers are investigating a threatening message found on a restroom wall at Jefferson Forest High School today around 1:50 p.m. The SROs, from Jefferson Forest and Forest Middle School, worked with school officials to ensure the safety of the students and staff at the school. Bedford County Sheriff’s field services deputies along with Virginia Game Commission Conservation Police Offices were at the school during dismissal assisting the SROs. Katie Hyatt Arrested and Charged with Three Home Burglaries and Four Grand Larcenies in Bedford County. 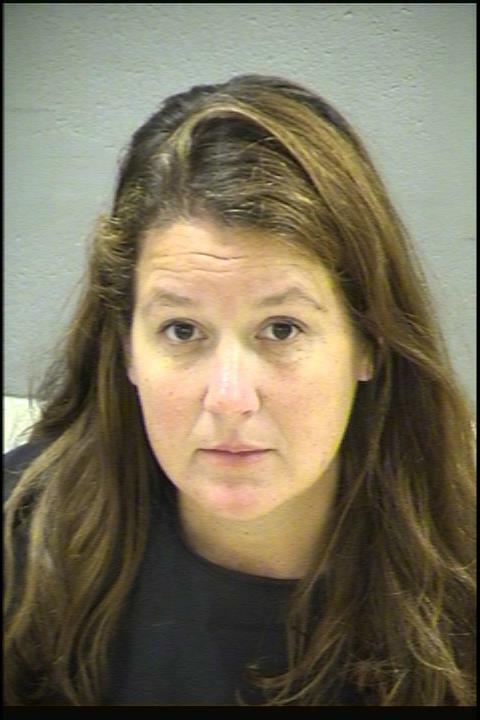 On Friday morning October 10, 2014, Bedford County Sheriff’s investigators obtained arrest warrants for Katie C. Hyatt, age 39, of Concord. Hyatt is charged with three home burglaries and four grand larcenies in Bedford County. 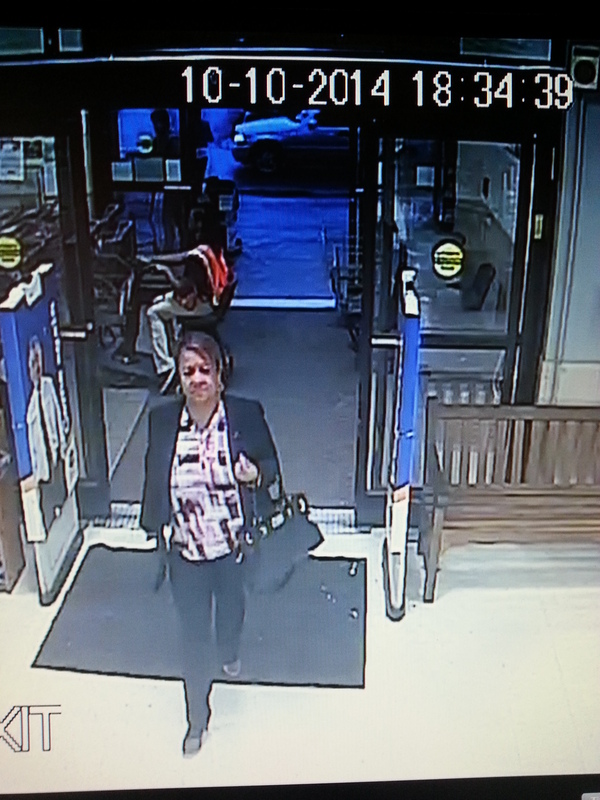 The additional larceny charge is taking firearms from one of a home. The crimes occurred between the end of May 2014 and September 2014. Hyatt is being held in the Lynchburg Adult Detection Center. There will be a press conference at the Bedford County Sheriff’s Office today, October 2, 2014, at 3:00 p.m. Bedford County Sheriff Mike Brown, Bedford County Commonwealth’s Attorney Randy Krantz and Montgomery County MD Police Assistant Chief Russ Hamill will address the media on the ongoing investigation into the Lyon sister’s case.